This was the last day of the Festival. At 11 am I took part in a travel writing workshop led by award-winning Cornish travel writer, Tim Hannigan. It was expertly run and I received some excellent tips on how to sell articles to travel magazines. The workshop was held in a rather grand room in the Union Hotel. 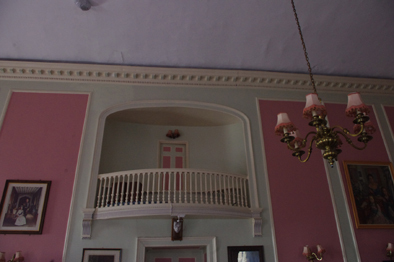 It was from the balcony in this room that Nelson’s victory and death at the battle of Trafalgar was first announced. 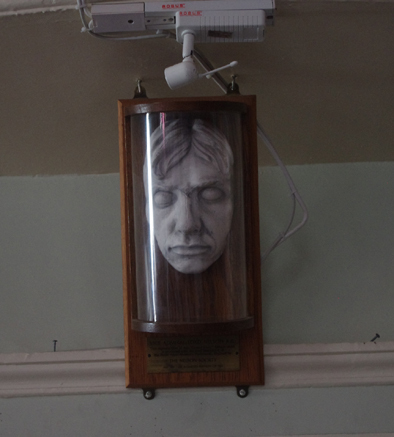 A rather ghoulish face which we were told was Nelson’s death mask is suspended below the balcony. Thus we discussed our views on how to make the best use of our travel adventures as an exceedingly unhappy Nelson looked down on us from above. I returned to the Acorn Theatre that evening to witness a script in hand reading by ‘The Wireless Ensemble’ of Penzance writer Stephen Saunter’s comedy radio play, “It’s What he would have wanted,” about along overdue burial. Given that I have recently witnessed two very sad funerals I should not have found it funny. But I did. After the performance finished I was honoured to be allowed to take part in Shout Kernow: the tradition of Cornish pub singing in the theatre bar. It was hosted by two ladies, Hilary Coleman and Sally Burley, who had succeeded in obtaining funding to travel to all the pubs in Cornwall to write down traditional songs they might hear there on condition that they would write a book of there experiences (some in the audience thought it an enterprising way of financing a pub crawl). The book has yet to appear but I added my email address to the long list of people who wished to be notified when it finally materialized. However, they did produce some song sheets and we set about them with great gusto with the aid of the Red River Singers. It was a perfect end to a great festival. Long may it continue. This entry was posted on Monday, July 21st, 2014 at 10:48 pm and is filed under Books, Travel. You can follow any responses to this entry through the RSS 2.0 feed. You can leave a response, or trackback from your own site.